This is for school holidays only. Gives you 10 days of traveling for one month. You can use the days whenever you want, so its perfect for making bigger trips in Japan. You can only use it on specific trains though, so the trips will be longer but a lot cheaper then paying the full price. This is the essential travelling card. It works very simply, you put money on it and going in and out of metro or train you beep it on the gates and you get charged the exact amount for the distance you made. Can be also used to buy stuff in some shops and even at some drink machines. Very handy, makes your travel a lot easier. This is for a one day free travel in Tokyo. There are multiple versions, just metro, metro and train, etc. I used the metro one. 600 yen for all day metro traveling is a nice deal and kind of a necessity if your place is a bit more out of the center. Lets start with the fact that I am not a good shooter. (Yet :p) So you can imagine my surprise when the first thing besides welcome the students in the kyudo club told me was that we have a competition on Sunday was quite a bit unexpected and a little shocking. I had a week to get used to the idea and now after this day trip I can tell you more about how a university kyudo competition looks and feels like. This was a Naka Kanto area competition between universities at the Dokkyo University kyudojo. It is a very interesting kyudojo. 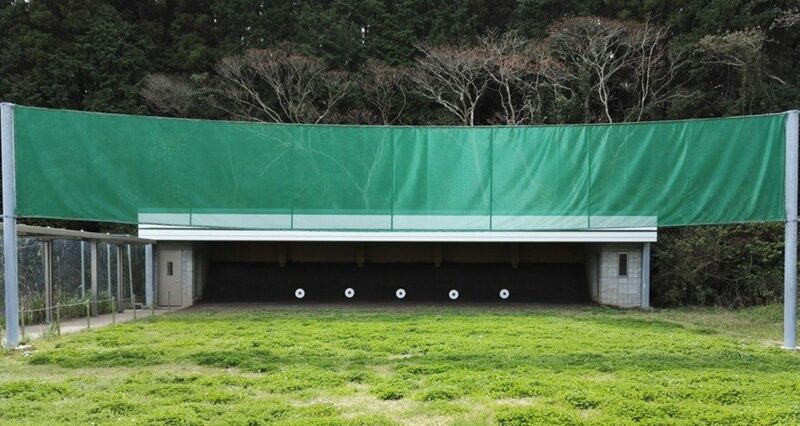 It is with the usual earth azuchi (target area) and open roof but with a green material instead of grass between the shooting area and the azuchi and it’s on the second floor . It is made to be used for competitions with hitboard and a small viewing area too. Speaking of viewing area, since its tiny basically very few people can watch the actual shooting at the same time. The two teams who are competing, the next two sitting behind them and a some others from the side. Most of the teams are somewhere else, resting, talking, shooting makiwara (Shooting form practice to close distance). Speaking of teams, it was a team competition. A team consists of 5 kyudoka (archer) and we shoot in renmei taihai style. Four arrows a turn. Two times two arrows in the hand. The dojo style is to do this in the sitting style, so after every arrow you have to go to seiza and wait for your next turn. As with many japanese martial arts there are many schools (ryu) in kyudo too. And to have a common ground between all of them there is the renmei style which is in a way neither, but developed from the others. This way the different schools can participate on events together. Also nowadays most of the people around the world are shooting only in this style. Like in Chiba it seems. I was the only shamen shooter as far as I can tell. But 2 out of 8 was a hit and maybe with the help of the sensei I am getting to know some of the problems why I miss a lot. Left shoulder is still weak and breaks out backwards to the side, left hand is still not strong enough and I am working on the new right hand movement I have started to learn recently. All in all, it is a lot better then even a week ago. So how did we do at the end? From 25 teams we ended on the 12th place. Not enough to qualify for the next round, the prefecture tournament but it was a good start. The competition is tomorrow! I am still not good, but improved some I think. We’ll see 🙂 I will bring my camera and will let you know how it went tomorrow night. I had the first class today. Loooot of things to learn. The way of the dojo work is a bit different too then home. Lots of reiho. I got a nice yumi and some arrows. Learned how to bring back arrows and clean them. Still having problems with what and when to shout back. The beginning and the end is a bit like at the shinto shrine. 2 rei, two claps, 1 rei. I am the only gaijin, so lets hope my Japanese will be better day by day! I am catching up with the last days posts and I will post them shortly. I have a lot of nice photos coming too! Keep looking, interesting things are coming! For example my first shiai on the 10th, I am second mato. Still have to get confident in the form.